My Primary OS is Windows XP PRO SP2 and for the past week I’ve been trying to find a way of installing OS X Tiger on my PC very quick and simple so far I’ve found various solutions, but each time I run PearPC I find a problem that once I correct brings another problem with it which can be very frustrating and I sometimes find my self going around in circles wondering why it doesn’t work, I will do some more investigation into installing OS X Tiger on Windows later this month, if all fails it looks like the only solution for me to test OS X Tiger out is to buy a Mac that of which I don’t want to do yet. [IO/IDE] The request could not be performed because of an I/O device error. My best bet is to do some research into these error’s, this is my first time I’ve actually ever tried PearPC or even looked a Mac OS so it’s been an experience so far and I hope to learn from it and eventually test OS X Tiger out if not maybe I can try OS X Panther that apparently easier to install. Windows Vista Auxillary Display for laptops. While searching on the web last night for anything interesting related to Windows Vista, I came across a very interesting blog article on how to make a “Windows Vista” (Longhorn) Auxiliary Display (now) for your laptop. I currently don’t have a Laptop so I wont be able to try it out, though I do have a pda so I guess I’m half of the way too doing it, if you do try this out please let me know how it turned out, Thanks. Microsoft has now gone live with its blocking technology that will require people to validate their copies of Windows before being allowed download access to updates. Genuine Advantage 1.0 program will check that anyone accessing Windows Update, Microsoft Update for Windows or the Microsoft Download Center has a genuine Windows operating system before allowing any downloads. Security updates will however be exempt from the ban. Microsoft has been testing the program since September and has validated more than 48 million systems so far, said David Lazar, director of Genuine Windows for Microsoft. Until now the program has been voluntary. Customers who discover they have a counterfeit copy of Windows will either be given a free version of the operating system or can purchase it for a discounted price, he said. To get the free version of Windows, a customer must fill out a counterfeit report identifying the source of the software, provide a proof of purchase and send in a counterfeit CD of the software. If customers don’t have all of that information, they can still fill out a counterfeit report and receive a copy of Windows XP Home Edition for $99 or a copy of Windows XP Professional Edition for $149, Lazar said. Windows XP Home normally sells for $199 and Windows XP Professional Edition usually costs $299. The move to lock out pirated copies of Windows from the download sites is part of Microsoft’s effort to fight software piracy, a major issue for the software vendor. 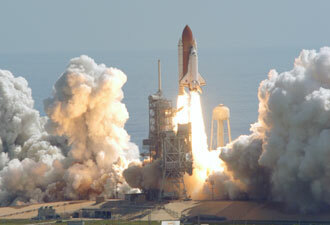 NASA’s Space Shuttle Discovery has finally returned to space after more than two years of hard work by the entire NASA team to get the shuttle up to the standards it needed to be, so a reoccurrence of the Space Shuttle Columbia disaster that happened two years ago does not happen ever again. 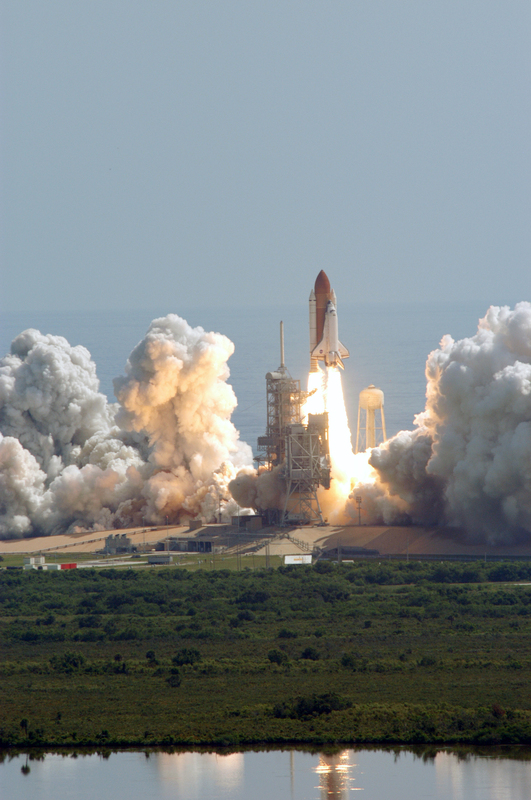 NASA says that the shuttle has not got a lot more life in it and that by 2010 they aim to have a simpler mode of transportation to service low-earth orbit. NASA’s Return to flight site. NASA’s Return to flight photos. As Microsoft Windows celebrates its 20th anniversary, Microsoft and IDSAA want to envision the future with you by offering a unique challenge. Whether you’re an established design team, an independent designer, or a student, here’s your chance to help shape the future of the Windows-based PC experience and to win up to $125,000USD, the recognition of the industry, and a distinction unlike any other. Download the entry kit today. Hitachi announced yesterday a new mirror that functions as a computer display. It will be available for purchase in Japan on Septermber 30. It combines a half mirror and a diffusion film to directly display digital information (text, photos, video, tv shows, websites, flash movies etc.) on a mirror surface using an LCD projector. This technology, called Miragraphy, also integrates sensors, RFID readers, barcode readers, cameras, etc. So, the mirror can automatically respond when people are aruond and personalize digital contents based on their sensed identities. The Miragraphy device could potentially be used at restaurants, bars, hotels, trainstations, airports, sports clubs, show windows, designer clothing shops, and accessory shops. The Internet Corporation for Assigned Names and Numbers (ICANN) has approved the .mobi domain name extension. The mobile phone industry has created this domain name becuase they say it will improve the way mobiles surf the net. They also say that the .mobi domains will create a “reliable and recognizable mechanism for internet content and services that are specifically tailored to a mobile experience”. It is estimated that the first domain names will be available during the first half of 2006, starting with a 90 day sunrise period, allowing corporations with trademark validated names to secure a .mobi domain. Generic second level domain names will be available on a first come, first served basis, after the sunrise period. When is Software Ready for Users? Just found this article on the IBM Website by Amy Wohl, and I must say it’s quite an interesting read to say the least. Once upon a time, developers worked on software in the privacy of their offices, writing and testing it until it was finished. Only then would they ship it to users. Today, things are very different. Aggressive users can see code even in a pre-alpha state and large numbers of users are invited to join in what amounts to a high volume test in the code’s beta period. Some software vendors have earned a reputation for letting the users be a significant part of the testing process, looking for bugs as well as for problems with useability or missing features. In fact, many users have given up buying software (or even upgrades) on their first release, waiting for a subsequent release or service pack before they feel confident enough to try a software packaging, however appealing it might be. But some software users revel in being able to use software as soon as possible. They enjoy every bug and bug report, feeling that they are part of the software’s development process, rather than just a user. (1) Ask. Users often know whether they would like to participate in the development process or whether they’d like to spend their time on their primary work tasks. Let them know what they’re getting into if they try software at various stages of the pre-gold code process. (2) Tell. Tell users just what to expect from a pre-alpha, alpha, or beta copy of your software. Tell them what will happen to their work if a fatal bug occurs. Tell them how much support you can offer them and how that support works (email? FAQ? telephone hot line?) Honesty is the best policy here. (3) Only offer very small rewards for participating in the development process. We note that some vendors offer BIG rewards to beta testers, leading some folks who are really unprepared for the work to take it on. Better to keep the rewards smaller to reduce temptation and to do a better job of non-disclosing just how much work you expect. I really respect a developer who tells the truth. Recently, I’ve been angling for a copy of a particular piece of Open Source software that’s not quite at alpha. It’s actually available on the web and its owners have told me where it is and that, of course, I’m welcome to download it if I want to. They’ve also pointed out that for someone like me who is (a) not a programmer and (b) mainly wants to see how the product looks and works, but not to help debug it, it would probably be better to wait a while. They’ve figured out (correctly) that I’ll have a better first impression if their baby product doesn’t crash the first time I try to use it. If only every developer was as thoughtful.